Originally posted at the website of the Chicago Political Economy Group (CPEG). An association of people with an elected leadership with no direct authority over its members whose primary purpose (which its members get to vote on) is to benefit its members, is so potentially oppressive to its members that they have the right to not pay the association for any its benefits (like more than doubling their wages in the last 12 years even as the association is required by law to provide these benefits to them. However, an association of people with unelected ownership-based leadership (some would say “class power”) that has direct authority over its members (in the sense that it can tell them – with some broad legal limits – what to do for 40 hours week, see for example: Economic Democracy by Robin Archer) whose primary purpose (in the U.S.) is to benefit its owner/leaders so that it is directly commanding its members to do things not in their interest but in the interest of the owner/leaders, has no oppressive power over its members but quite the opposite. The leader/owners of this association will be “oppressed” if they have to not discriminate in benefits that they are legally required to offer to their members. Let me restate this is simpler terms. In democratic organizations whose purpose is to benefit members, we’re worried that requiring members to pay for benefits that they have voted on and received, will violate their civil “right” to free-ride by not paying for received benefits? But in authoritarian organizations whose overriding purpose is to benefit owners, we’re worried that requiring the owners to pay for legally required equal health benefits for women and men will violate their civil “right” to discriminate against women based on their religious precepts by denying them certain kinds of health benefits? In democratic organizations we’re worried about “top-down” oppression of members by not allowing them to “free-ride”? But in authoritarian organizations we’re worried about “bottom-up” oppression of bosses by not allowing them to discriminate? Yup. You got it. The first is the Supreme Court’s Harris v. Quinn decision, and the second the Hobby Lobby decision, both released on Monday, June 30, 2014. You couldn’t ask for a better demonstration of the bankrupt “classic liberal” and Neoclassical Economic ideology of corporations as “private” actors with no social power, a “free and voluntary” realm of “equal exchange” contracts, vs. its view of unions as oppressive sources of tyrannical power that impinge on “individual civil rights”. What could be more backward! And note that the standard argument that the power of “exit” makes the labor contract “voluntary oppression” (which is nonsense anyway as we all know most workers cannot just “quit” their jobs without potentially incurring severe costs to themselves and their families especially in the current economy with close to 10 million “officially unemployed!) doesn’t work here in any case. Why is it somehow less oppressive for a women at Hobby Lobby to have to quit her job in order to find an employer who won’t discriminate against her, than it would be for an SEIU HCII member to quit his/her job to find one without an “oppressive” union forcing her/him to pay a “fair share” fee for raising his/her pay and benefits? The second association is a “person” whose “civil rights”, including its “right” to impose its religious precepts on its members without their consent, cannot be violated. For example, even though it is an expressly undemocratic organization whose purpose is to serve its owners/leaders and not its members, it has a “free speech” “right” to use money derived from its members for political or other purposes over which they have no say. But the first, democratic, association that works for its members does not even have the right to be compensated by its members for work that it does directly for them. This association is a potentially oppressive tyrant that is already is prohibited from using money derived from members for political activity without their consent. 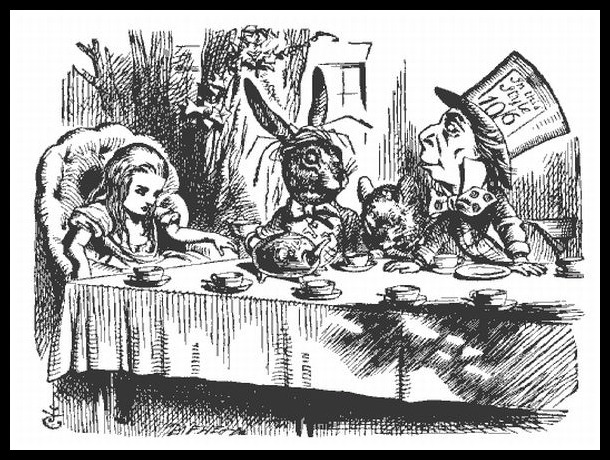 Talk about “Alice in Wonderland” Logic – these guys (the five) belong in a rabbit hole not on the Supreme Court!